Rodrigo, a Sri Lanka schools under 19 representative missed the recently concluded Youth World Cup in Bangladesh but has been among the runs in the current school cricket season. Rodrigo’s closest rivals Ramesh Nimantha from St. Servatius College, Matara and Lasith Embuldeniya of Royal College Colombo who was also unfortunate not to be selected for the under 19 World Cup despite a rich harvest of wickets during the season, is placed in the platinum contest. 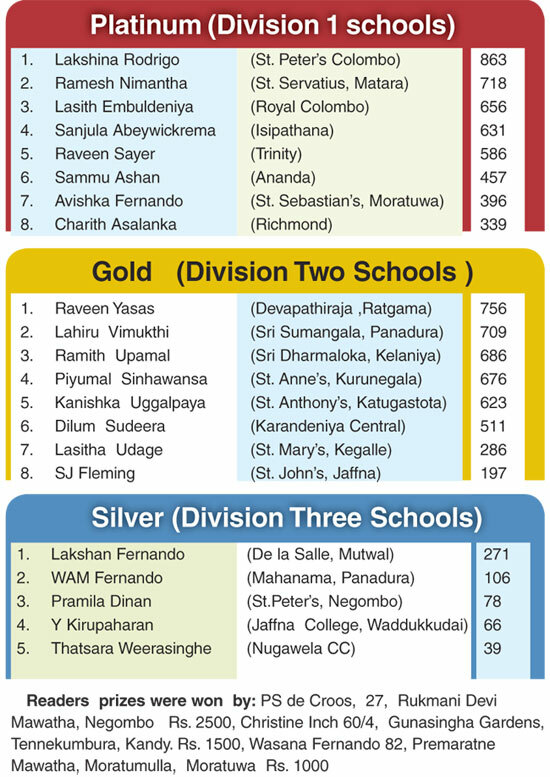 In the Gold segment for schools playing in the Division Two segment, Raveen Yasas from Devapathiraja College Ratgama polled in 756 votes.